‘Virtually every poll taken of Arab opinion since 2001 affirms a central point of this book: that anti-Americanism has been, and generally remains, an expression of profound Arab opposition to US bias and support in favour of Israel, rather than hostility to American culture and values. What follows is a summary of each chapter with quotations of key sentences and paragraphs.On the assumption that many readers are familiar with the main facts of what happened – eg in the Suez crisis in 1956 and the Six Day War in 1967 – most of the quotations focus on Arab responses to these events and to American policies. After what seemed the failure of the aggressive evangelism of the first American missionaries (1820 – 26) in Lebanon, who were critical both of Islam and of the eastern churches, a new generation of missionaries (from 1830s) developed ‘a new mission’ which was ‘less belligerent and more successful’, placing more emphasis on education and other forms of service. – Strong reaction of the Maronite patriarch to the evangelism of the missionaries led to the imprisonment and death in prison of As‘ad Shidyaq, the first convert to Protestantism (1826). – The earliest missionaries were motivated by millennialism, believing in the necessity of the restoration of Jews to Palestine before the Second Coming of Christ. – Commercial treaty in 1830 between US and Ottoman Empire led to appointment of an American consul in Beirut. – New Arabic Bible translation initiated by Smith, and completed by van Dyke, who had mastered Arabic and had much greater openness towards Arabs. These new missionaries came to present themselves as ‘avatars of modern science, technology and spirituality … apostles of progress as well as of Protestantism’ (48). By 1850 they had established mission work in many major cities and villages across the region. Beirut had become ‘the undisputed Arab jewel in the American missionary crown’ (38). By 1850 Protestants were recognised in the Ottoman Empire as ‘an autonomous and protected religious community’ (43). – 1868. Syrian Protestant College founded under Daniel Bliss and William Thomson, ‘the first institution of its kind in the Arab region’ (52). ‘This new institution would take the missionaries in new and ultimately secular directions’ (52), creating ‘a new kind of secular American presence in the region’ (52). The positive attitude of Arabs towards America in the 19thC were largely formed in response to the work of American missionaries working in the region. A further reason for positive attitudes towards America among Arabs in the 19thC was the perception that America, unlike Britain and France, had no imperialist ambitions in the Middle East. Some Muslims, however, were concerned about the impact of Christian missionary activity. Arabs immigrants to the US expressed ‘the wonder and alienation that defined the Arab discovery of America’ (94). Some came to ‘discover in America a promised land’ (53). Some were more critical of what they saw in the US, and others (like Khalil Gibran) became more critical of the countries from which they had come. – ‘From the very beginning, the impetus for the earliest repudiation of America came from either those who were threatened by the missionary message or those who were disenchanted by the profound gap they experienced between their idealization of “America” and its vastly more complex reality.’ (56-7). After the defeat of the Ottomans in World War I, President Woodrow Wilson’s vision of a new world order, based on the principle of self-determination, aroused great hopes among the Arabs. But his support for the Balfour Declaration went against his insistence on self-determination. At the Paris Peace Conference in January 1919 there were deep disagreements about the future of the Middle East. At the suggestion of Howard Bliss, President of the Syrian Protestant College in Beirut, it was agreed that a ‘Mixed Commission’ should visit the countries of the Middle East to find out the aspirations of the people. This commission, which came to be known as the King-Crane Commission, visited the region for 42 days in June and July and presented its report in August 1919. The findings of the Commission were completely ignored by the great powers. Arab nationalists had great hopes of America when they met in Damascus in July1919 and when Faysal was proclaimed king of a united, independent Syria in March 1920. But the British and French disregarded the wishes of the Arabs, and at the San Remo Conference in April 1920, carved up Syria. Faysal’s small army was defeated by the French in a battle at Maysalum in July 2910. 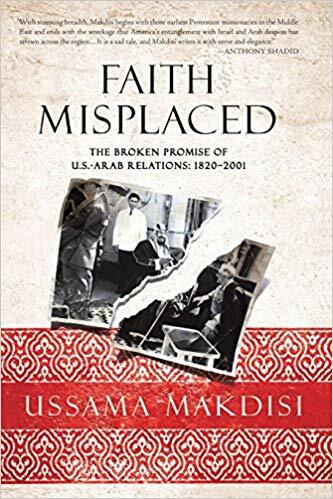 ‘Christian and Muslim Arabs were subject to popular American indifference, if not total ignorance… America had little interest in, or sympathy for, Arab nationalist aspirations’ (154-5). In the months and years leading up to the UN vote on the partition of Palestine in November 1947, several well-known academics who knew the Middle East well warned the US government very clearly about the implications of supporting the vote for partition. In October 1956, when Britain and France conspired with Israel to invade Egypt to stop Nasser’s nationalisation of the Suez Canal, General Eisenhower forced them to withdraw. ‘Rather than fighting imperialism, the US became the new face of imperialism to many Arabs. American officials would protest the label of imperialism vociferously, but there was no denying that a new age of American power had dawned in the Middle East. Nasser played a major role in the build-up to the 1967 war. The defeat of 1967 encouraged Palestinian resistance movements like the PLO and the PLFP to turn to violence. Abdullah Tariqi, Saudi oil expert and former minister of petroleum and mineral affairs ‘was yet another in a long line of Arab reformers who noticed the enormous gap that separated American professions of democracy and freedom from the reality of US actins in the region … Inspired by Nasser, Tariqi understood that he struggled against the tribalism and nepotism of the Saudi monarchy as much as against a powerful American oil company … For Tariqi, the answer … to the question of why the Americans had such contempt for the Arabs was both economic and political … Not only did the Arabs possess vast quantities of proven oil reserves, but their oil was the cheapest to extract and refine in the world. As a result, the US actively worked for a quiescent, divided Arab world, just as it had promoted dictatorships in Latin America … The US, in a word, was opposed to what Tariqi regarded as progressive political movements such as Nasser’s because they carried within them the potential for a new balance of power. In this view, then, Israel was not a state of the Jews as much as it was “a 100% American base,” utterly dependent on the US and at the same time an extension of US influence in the area. After the October War in 1973The Arabs used their oil embargo as a weapon against the West. By encouraging Egypt to make its own separate peace with Israel, Secretary of State Kissinger was working to detach Egypt from the Arab world and bring it under western influence. In his own words, ‘We have to find a way of splitting the Arabs.’ Sadat responded because of his own ‘ambition of bringing Egypt firmly into a US orbit.’ (312) Sadat hoped that the Camp David Agreement of 1978 would not only lead to Israel returning Sinai to Egypt, but also further the cause of the Palestinians. But in the end recovering Sinai was more important to him than helping the Palestinians. The rise of Islamism can be seen as a response bothto western imperialism andto the complete failure of Arab nationalism. ‘The age of secularism was made to give way to Islamism in various forms’ (349). Israel’s invasion of Lebanon in June 1982 and its subsequent occupation of the south led to the creation of Hizbullah. ‘In the Palestinian territories, a popular and relatively nonviolent uprising or intifada, against the Israeli military occupation between December 1987 and 1990 garnered considerable sympathy for the Palestinians on the world stage, including America itself. Yet the US government contented itself with issuing halfhearted calls for restraint even as Israel crushed the intifada. No sanctions were placed on Israel. And yet when Arabs pointed to the blatant double standard in the enforcement of UN Security Council resolutions in the Middle East, the US went out of its way to deny publicly any linkage between the two situations and to insist that it was an “honest broker” in the Arab-Israeli conflict. At the Camp David summit in July 2000, Clinton failed to get the Israeli prime minister, Barak, to come to an agreement with Arafat. 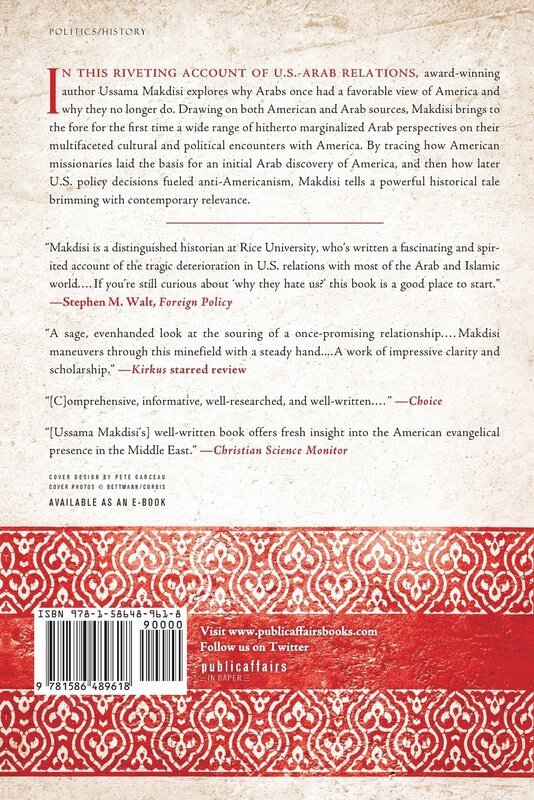 The book ends with Makdisi’s assessment of how western and especially American policies have affected developments in the Middle East up to 2001, drawing attention in particular to the rise of violent expressions of Islamism. ‘Hizbullah’s triumph at the dawn of a new century was thus accompanied by a new wager that Islamist politics would succeed in bringing freedom to the Arabs where a secular Arab nationalist politics had clearly failed. Nasrallah turned on its head the US and Israeli assumption that the historic failure of Arab states to defeat Israel would inevitably lead to a victor’s peace. For over fifty years, anti-Americanism had been tied inexorably to the question of Palestine and to the visible role played by the US in legitimating, financing, and protecting Israel at the expense of the indigenous Arab population. Yet rather than resolving anti-Americanism by resolving its obvious root cause in a manner that could win Arabs over to America – that is, by supporting the struggle for a just, secular solution that encompasses the rights and security of Palestinians and not simply those of the Israelis – the US during and after the Cold War had banked on Arab exhaustion and Israeli strength. ‘Indeed, since 1967 at least, US presidents have believed that the Arabs must eventually accept Israel regardless of how it treats the Palestinians, and that the resistance of Arab states to Israel will wither in the face of Israel’s apparently insurmountable military strength and the US commitment to that strength. To a large extent, this belief has been vindicated at the level of Arab regimes. Sadat was the first Arab ruler to embrace openly the American vision of the Middle East. But this major American and Israeli victory was only partial, and the price paid to achieve it was extraordinarily high, for it involved sacrificing the possibility of a pro-Western Arab world in favour of pro-American Arab dictatorships. The age of secularism was made to give way to Islamism in various forms. ‘As Nasrallah stood in Bint Jbeil to mark a historic Israeli defeat in May 2000, it was clear to him that Arab faith in America had been shattered. He knew that both Sunni and Shi‘a Arabs resented US policy because it had enabled, justified, and protected Israeli colonialism. Hizbullah drew strength from this fact. So too did Hamas. Their Islamist politics, however, was fraught with enormous problems. Both movements appropriated the mantle of freedom from their Arab nationalist antecedents, but they rejected their secularism. They drew instead on an unvarnished religiosity, a deep belief in sacrifice, and a commitment to continue by modern means a long-standing rejection of Israel. But to what end? Hizbullah may have chased Israel out of Lebanon, but Israel remained powerful, and the Palestinians were no closer to liberation than they were before. American aid continued to pour into Israel. The gulf between people and rulers expanded in the Arab world; democracy and freedom of expression remained stifled; and militant Islamists continued to gather strength, exploiting and acting upon the loss of faith in the West that has permeated Arab societies. This entry was posted in Middle East and tagged Colin Chapman on July 12, 2018 by Stephen Sizer.